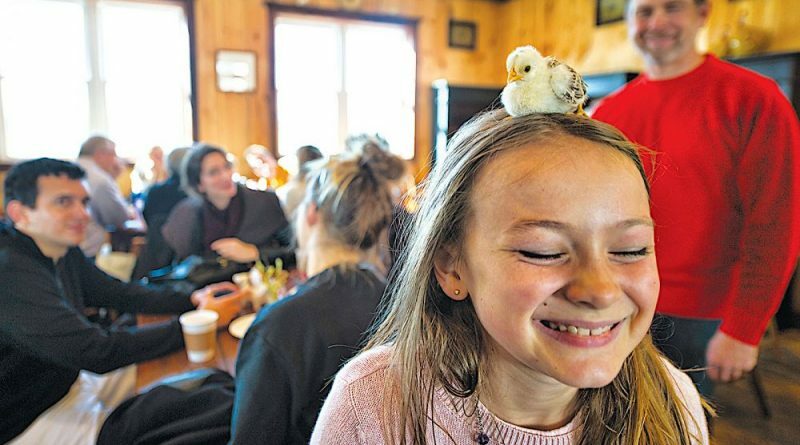 Brunch is a relatively new addition at Faith Like a Mustard Seed Farm near Lucketts, but is quickly becoming a big draw for the working farm, known for high-quality, heritage-breed pork. When Patricia Glaeser, a former private chef, and her husband, Karl, a retired naval officer, bought the farm seven years ago, Patricia already had a restaurant in mind. That dream became a reality last year when the couple began to serve brunch on a small scale on Saturdays and Sundays. To comply with county regulations, Glaeser and her hired chef are cooking out of a food trailer while raising money for a larger septic system that will allow them to build a commercial kitchen and expand seating. The farm’s ambiance is a big draw for visitors who can hang out with pigs, poultry of all kinds (including some chatty geese), horses and dairy cows who are milked daily. Faith like a Mustard Seed Farm is a working farm that also serve’s brunch on weekends that focuses on fresh foods, many of which are raised on site. Here owners Patricia and Karl Glaeser pose for a photo in the dining room. But the food is also garnering raves. Glaeser uses locally sourced ingredients—from their own farm and other area growers. Favorites include buttermilk pancakes with local buttermilk and seasonal toppings like a pumpkin creme anglaise, Moroccan eggs, sunny side up in a spicy ragout served with naan bread and goat cheese, biscuits and gravy with sausage gravy made from the farm’s own sage sausage, and house-made chorizo on tostadas. “We’re not like a normal brunch place,” Glaeser said. One small drawback for some brunch lovers: because of space limitations and a need to turn tables to meet demand, the farm doesn’t serve alcoholic beverages yet. However, Glaeser says they’re looking to add a drinks component as they expand kitchen and seating capacity. Meanwhile, the owners suggest a farm brunch as a start or finish to a day visiting area wineries or breweries. 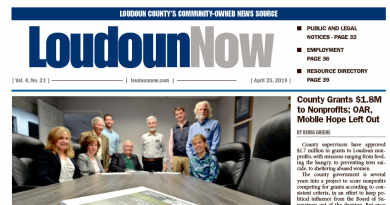 Drinks, on the other hand, are a big draw at eastern Loudoun favorite Ford’s Fish Shack, which has locations in Ashburn and South Riding. The restaurant was a local pioneer of the bacon bloody Mary (bacon vodka, house made mixer, garnished with bacon), which remains a fan favorite, along with Ford’s pickle bloody Mary. 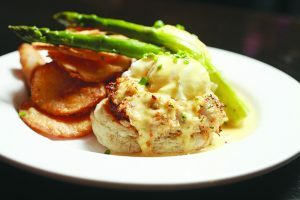 The seafood-centric brunch menu features both lunch and dinner favorites like the restaurant’s popular fish and chips, as well as more traditional brunch fare with a seafood twist, like crab cakes Benedict and campfire trout and eggs. “We try to leave the top selling lunch and dinner features on the menu and add traditional brunch items. We try to give the best of both worlds,” said owner and chef Tony Stafford. Stafford, who worked at seafood restaurants in New England before opening his Loudoun hotspots, has sought to convey the New England tradition of casual seafood dining and break the mid-Atlantic mindset of seafood as fare for special occasions. And brunch at Ford’s is usually a lively family affair. “I wanted something that was casual, something that people can go to seven days a week,” he said. One New England tradition Stafford especially loves at Ford’s is Rhode Island-style “coffee milk,” coffee syrup added to milk, always a delight for Loudoun’s northeastern transplants. Great music and a brunch buffet featuring award-winning barbecue are the draw at Leesburg’s Smokehouse Live’s weekly Sunday brunch buffet. The brunch attracts regulars who come each week for consistently good and diverse music—from old school bluegrass to more contemporary country, said owner Jim Foss. Ashburn-based Delta Spur is one of the restaurant’s most popular acts, regularly playing both the country brunch and free evening shows. “They’re tremendous. They’ve been very good for Smokehouse, and Smokehouse I think has been very good for them,” Foss said. Foss said popular items at the all-you-can-eat buffet include a scrambled egg station, biscuits and gravy and, of course, the restaurants regionally acclaimed barbecue. Foss likes to rotate the featured protein so regulars don’t get bored, sometimes smoking a whole hog or featuring the restaurant’s popular smoked brisket. Changing up the barbecue, as well as the music, keeps returning guests happy and entertained, Foss said. Faith Like A Mustard Seed Farm serves brunch Saturdays and Sundays from 11 a.m. to 3 p.m. More information is at faithlikeamustardseedfarm.com. Ford’s Fish Shack serves brunch Saturdays and Sundays from 10 a.m. to 3 p.m. at its Ashburn location and 11 a.m. to 3 p.m. at its South Riding location. Find details at fordsfishshack.com.